If you caught this video, you heard me talk about a couple of the items featured in this outfit! I’d be on the hunt for a simple pair of gold sandals to wear to weddings, parties and other fancy occasions that wouldn’t steal the show from the rest of my outfit. Most of my occasion shoes have “statement” written all over them, so I was in need of a good, classic pair that I could wear with anything! Since I’ve gotten so much use out of my Stuart Weitzman heels in the same silhouette, when I saw this Rachel Zoe pair in bold gold I knew I’d found the right pair. While Stuart Weitzman has a gold pair, I didn’t want textured fabric, and the shade of gold wasn’t what I was looking for. The shade of gold on these sandals is perfect for summer to wear with brights, whites, and more! They definitely have a wow factor, but not so much that they take away from my look. The other item I’d been struggling to find was a gold wedding-appropriate clutch. While I was absolutely in need of one, I didn’t want to spend a fortune on something I’d only wear a few times a year. I’d been leaning towards this Nancy Gonzalez clutch, but never pulled the trigger. I think I would’ve been happy with it, but I really wanted something that would stand out. I wanted a clutch that could be worn as easily with jeans as it could with formal attire (so I could get way more use out of it! ), and I wanted something different. This cage clutch was the answer that problem! It’s unique shape, structure and caged section of pearls gives this bag some edge. I wore it to the wedding I went to in NYC last month, and it easily fit my phone, room key, ID + credit cards, and a lip gloss! Surprisingly spacious for something so small and rigid. It’s just what I needed for those special events, but I’ve worn it out with jeans and heels even more! I felt way more comfortable spending more on this clutch than I would have about something formal-specific. This clutch does double duty like no other. The last item I want to mention is this under $80 dress from Tuckernuck! 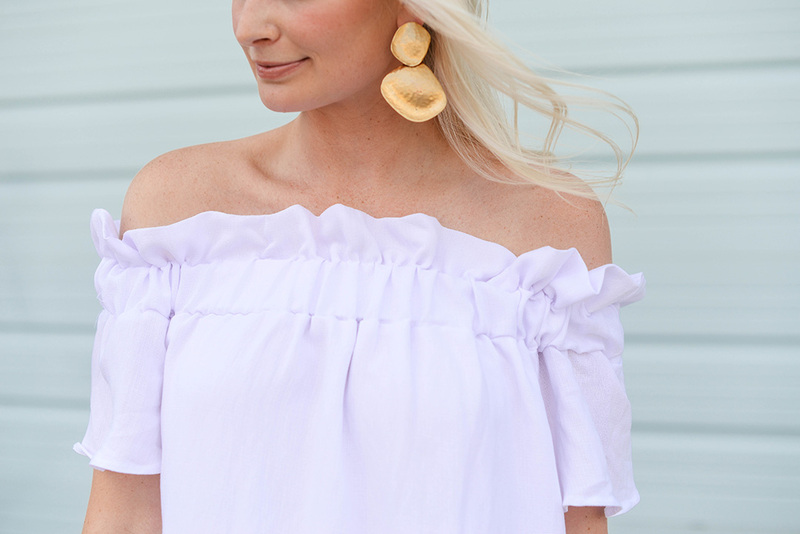 You all know how much I love a flattering off-shoulder style, and solid styles I can wear repeatedly I love even more. This dress has endless styling possibilities, can be dressed up or down in a pinch, and is such a steal! Need I say more? PS – if you order today and enter code SHIPFORJULY4TH at checkout, you’ll get $15 off and get it in time for the holiday weekend! That white dress is so cute! The fact that it is under $100 is amazing! 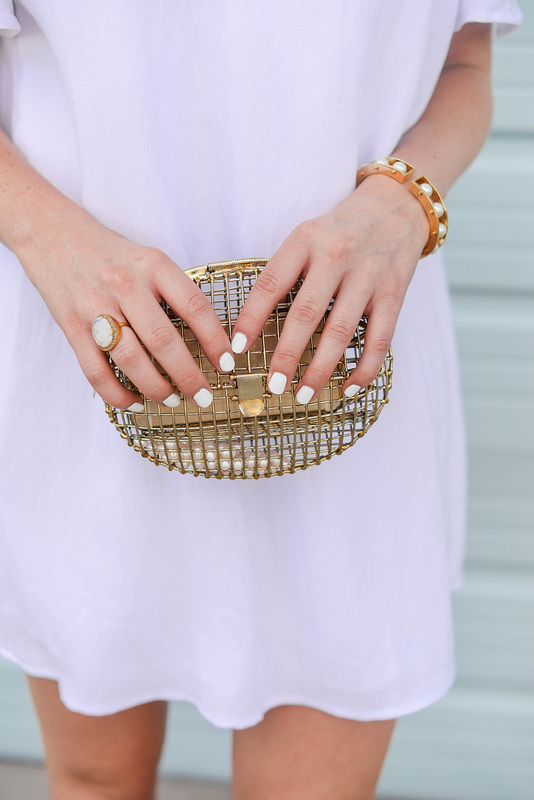 That clutch is perfection! Will be a forever classic piece! Good luck at your new house, can’t wait to see more! My friend sent me a link to this dress as an option for my upcoming bachelorette! You are styled perfectly for a bride to be on her bachelorette here!! Love it! Though that store doesn’t ship to Canada… womp womp. Absolutely love this look on you! You look stunning from head to toe! I love the dress, your earrings and the cage clutch! FAB!